There 4 different styles and also 5 color variations of each tile. I’ve prepared 4 rendered .png versions (0.5x, 0.75x, 1x and 2x) but there’s also a svg * version of each file. This means you can scale it up without loss of quality (vector graphics). 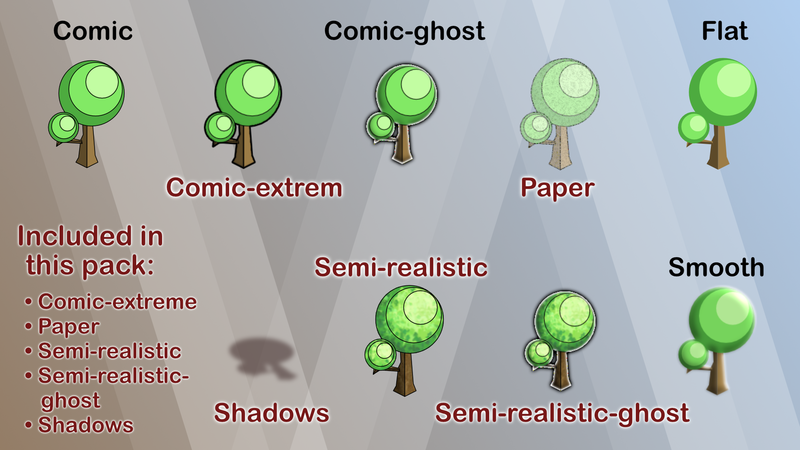 * .svg is sadly only for “comic”, “comic-extreme” and “flat” available. All other styles are just .png files, because of their half vector and raster format. If you need more styles, check out my Standard Starter pack. Update 1.2 – Water Update is released! Update 1.3 – Style Update is released! More updates for this package will follow. There’s much more planned – be prepared for the absolut isometric madness!